For years, behavioural psychologists have known about Self-Suggestion. It’s the science of repeating positive affirmations enough, so they actually "sink into" the brain – and become part of your actual personality. It's what psychologists called "Programmed Rehearsal" and doctors call "Autosuggestion." Self-Suggestion is proven by science: Brain research has shown that it takes ONE MONTH of affirmation repetition for new attitudes and behaviours to "INSTALL" automatically into the mind. You might have heard that fact before. And this process of changing your mental attitude is critical to manifesting everything you desire in your life. NOW, for the first time ever, self-development guru Bradley Thompson has put together a powerful program containing over THRTY powerful Self-Suggestion AUDIO SESSIONS – which "install" those behaviours for you, automatically. Covering everything from confidence to energy levels to relationships - and more. Ready-to-run AFFIRMATION SESSIONS: just LISTEN and CHANGE! Each 15-minute audio session contains HUNDREDS of positive, empowering affirmations - designed to help "rewire" your thinking, change your behaviour, and manifest just what YOU want in life. This is "NEW SOFTWARE" for your BRAIN. With each 15-minute session, you'll be guided into a light trance, and fed hundreds of positive affirmations to change your self-image - and ultimately change your life, QUICKLY. All YOU have to do is listen to your specific session, once or twice a day. You can listen to up to five sessions during any one period. With Self-Suggestion, you WILL begin noticing BIG CHANGES– starting within ONE WEEK. Would YOU like to discover the world of Self-Suggestion? Self-help leader Bradley Thompson has pieced together over 30 professionally-created Self-Suggestion audio sessions to change your life – in record-time. These are your own personal AFFIRMATION SESSIONS, designed to CHANGE your LIFE. And he calls this program collection: The Self-Suggestion Kit. Enjoy an abundant, prosperous lifestyle - with the suggestions inside this relaxing session. Tap into the many, life-rewarding benefits of deep, power breaths - with this guided session. Allow powerful self-suggestion to boost your confidence and assertiveness - with this great audio. Repair your perfect self-image using positive affirmations - with this self-suggestion session. Tune into greater self-esteem and happiness - simply by listening to this relaxing session. Suggest yourself to becoming a more creative, innovative individual. Incorporating binaural beats. Allow your mind to absorb powerful, positive, optimistic affirmations - with this refreshing session. Rescue yourself from dull-minded, overwhelming depression - with the help of this liberating audio. Feel fresh, invigorated, alive, and like a brand new person - after listening to this binaural audio. Need to tap into your massive, hidden reserves of energy? This is the ultimate session. With binaurals. The ideal way to start your day - this refreshing program leaves you feeling energized and full of life! A truly relaxing session, programming your mind to become more empowered and eliminate fear. Suffering from a panic attack? This relaxation session will enable you to calm, release and stabilize. Designed to strengthen your health and build your immune system, this session combines suggestions, binaurals and an OM chorus. Enjoy long-lasting pain relief through self-suggestion, with this session. Contains embedded binaural beats. Allow the white healing light to energize, purify and cleanse your body - all inside this session. Take a deep, deep dive inside yourself, and tap into mid-range Delta levels. Relaxing, binaural session. Program your mind before work, every day - and ensure you're raring to achieve! Includes binaurals. Rocket your concentration levels and improve mental acuity - with this session, containing binaurals. Self-suggest your way to operating at peak performance, 24/7 - with this binaural beats session. That big speech is about to start. Get yourself in-tune with greatness - thanks to this powerful self-suggestion session! Need to rocket your local friendships? Enjoy greater social success - with this binaural beats session! Having trouble embracing, accepting, loving your close ones? Self-suggest your way to friends and family bliss! Become a more peaceful, forgiving individual - with the positive, loving suggestions inside this session. Slowly step through four levels of deep relaxation, letting go of everything - coming out feeling refreshed and relaxed. With binaurals. Allow your stress to melt away like a quick-burning candle - with the powerful suggestions in this audio. Every day needs a little time-out! Relax, de-stress and re-energize your mind. Includes binaurals. This ultra-relaxing, binaural-only session will gently take you into a deep, invigorating sleep. See you in the morning! Do not put on loop. Woken up mid-way during your sleep? Let this white-noise session help you nod off once again. A powerful, four-part program - including one main session - for letting go of addictions in your life. Listen at least once in order, then as needed. Listen to Session 2 again to reinforce the main benefits. A wonder-results program for the ultimate in weight loss - incorporating one main session. Listen to all four sessions in order at least once, and as needed thereafter. Listen to Session 2 again to reinforce the main benefits. You can listen to a mixed sample of our Self-Suggestion sessions by clicking here. Access to these sessions come is delivered via email immediately after purchase. Each session lasts for exactly 15 minutes. Just listen, relax - and change! Got questions? Try checking out our Frequently Asked Questions. But if you order in APRIL, you’ll receive even MORE. FREE Copy of “The Secret Art of Self-Development"
This is an extra special bonus. We'll also include a digital version of "The Secret Art of Self-Development" absolutely FREE of charge, too! If you're not absolutely THRILLED with the results you experience with The Self-Suggestion Kit, just contact us to let us know within a month. We'll refund EVERYTHING you paid. This guarantee is backed by the Self Development Network. Self-Suggestion is the QUICKEST METHOD of changing your life. It allows you to install positive, new "programs" directly into your mind. It’s all based on the science of "Programmed Rehearsal" and "Autosuggestion" – and built on many of the same mind programming principles as NLP, hypnosis, belief, and subliminals. Just listen to these relaxing audio sessions – allowing the POSITIVE, EMPOWERING AFFIRMATIONS to install into your mind - and you’ll begin seeing results WITHIN A WEEK. Whether you want greater confidence, weight loss, energy, health, relaxation or creativity - these Self-Suggestion audio sessions can help! You’ll receive digital access to Bradley Thompson’s collection of over thirty Self-Suggestion sessions. Listen on any computer, or device from anywhere! Change your life in DAYS – just by listening to these POWERFUL audio sessions! Self-Development" - Book AND Audio! Discover the ultimate self-help treat from Karl Moore. You get access to the book and audio version too. Worth over $35! We promise you'll be thrilled with The Self-Suggestion Kit. If you're not, return within a month for a full refund. 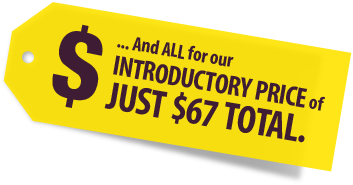 SPECIAL OFFER: CURRENTLY DISCOUNTED TO JUST $57!! YOU could be feeling the awesome effects of your very own "AFFIRMATION SESSIONS" - within JUST DAYS from now. All by deciding to try out The Self-Suggestion Kit, RISK-FREE. CLICK HERE to Read Our Health Precautions & Disclaimer.